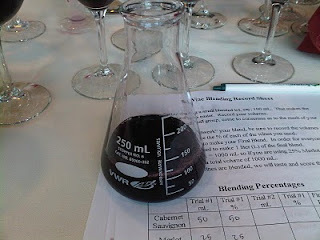 Back in September I attended an event called BLEND, a food and wine tasting featuring wines from inside and outside of Washington (all blends, no 100% varietals allowed! ), as well as food from a variety of resorts and conference centers. The event, which benefited the Washington Wine Industry Foundation, was held at the beautiful waterfront Bell Harbor International Conference Center. BLEND was put on by the wonderful Jamie Peha of Peha Promotions. Some of Jamie's past events I've attended include Wine Rocks Seattle and The Seattle Food & Wine Experience, which were both fantastic food and wine events. BLEND was one of the same, offering great wine, food, and views (once that pesky cruise ship decided to get out of the way). 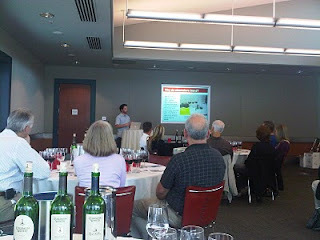 Our first stop at BLEND was a Bordeaux blending seminar, put on by Columbia Winery. This seminar might have been the most enjoyable parts of the whole BLEND experience and I highly recommend the seminars for anyone who will attend this event next year. We started out by learning some great facts about the Bordeaux region in France and how the blending of different grapes from this area came to be. In France, blending is most often tradition and all of the different regions have their own rules and traditional blend of grapes. In Burgundy, no blending is permitted and wine makers actually risk jail time if they are caught blending the grapes of this region. In Bordeaux, anything goes. They will blend everything. The five Bordeaux grapes used in their blends include Cabernet Sauvignon, Cabernet Franc, Merlot, Malbec and Petit Verdot. Carmenere is permitted, but is almost never grown. I was interested to learn also about the different blends that come from the left bank and right bank sides of the Gironde river in France. Left Bank wines are generally Cabernet Sauvignon based blends, with Malbec and Petit Verdot being added mostly to enhance the color. The soil on the Left Bank contains more gravel than the more dry soil of the Right Bank. Right Bank wines are mostly Merlot and Cabernet Franc based. 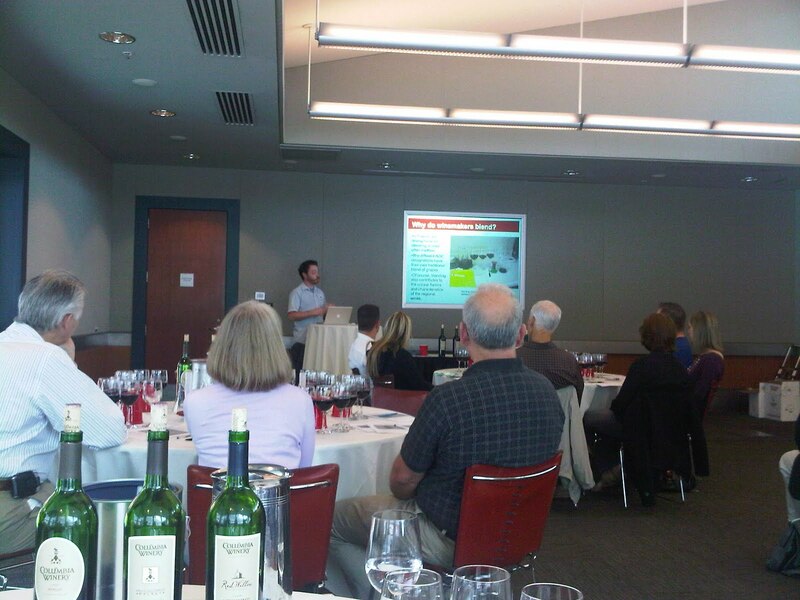 For this seminar, Columbia Winery provided their bottles of Cabernet Sauvignon, Merlot, Malbec and Cabernet Franc for us, as well as some blending "guidelines" for the blends. 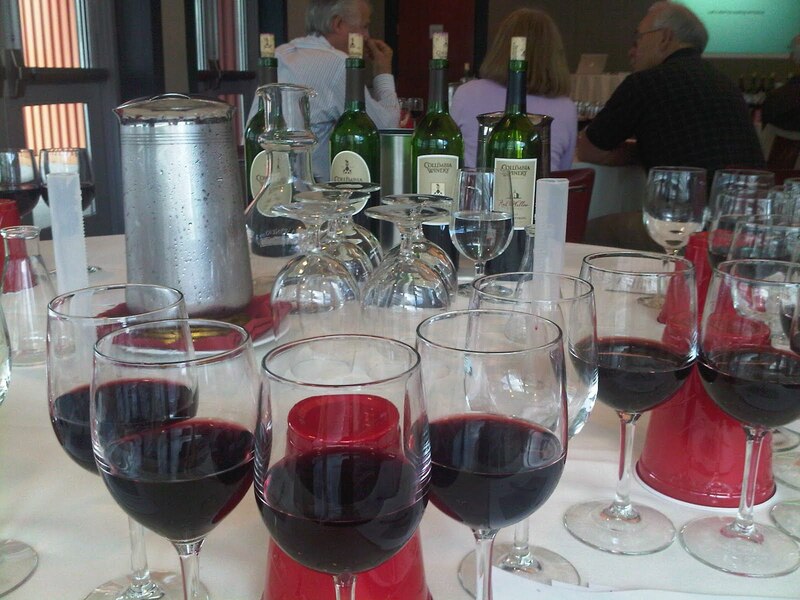 (Cabernet Sauvignon: 25-75%, Merlot: 15-40%, Malbec 1-20%, Cabernet Franc 1-20%, and Petit Verdot: 1-20% (we were not blending with Petit Verdot at this seminar). Also at our table were several beakers, measuring containers so we could get the exact % blend and some charts to record our sample blends. With wide and eager eyes we set off on our blending adventure (It's science!). Each table was given the task of creating their own blend, which would then be blind tasted by the entire room, with a winner chosen off the vote of the room. Our wine "dream team" included myself plus Clive Pursehouse (@clivity) of The Oregon Wine Blog; Annie Hong (@blackpearlSEA), GM of the fabulous Black Pearl restaurants; the one and only Sean Sullivan (@wawinereport) of Washington Wine Report (did you see his "100 Best WA Wines" article in Seattle Metropolitan's September issue? 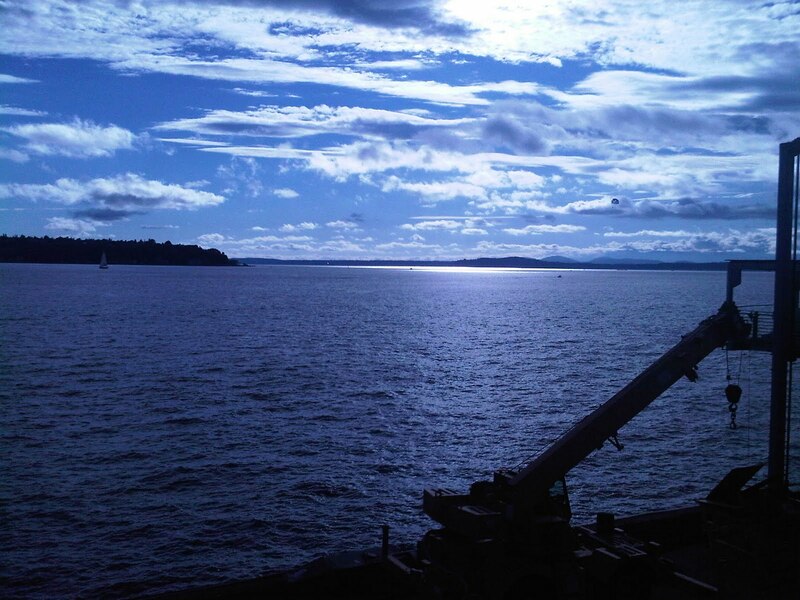 ); and Jessica Voelker (@JessVoelker), Seattle Metropolitan's lifestyle editor. We each set about creating our own blend (basically, we just winged it) with the wines provided. My first trial was a 50% Cabernet Sauvignon, 25% Merlot, 20% Malbec, and 5% Cabernet Franc blend, which I thought didn't turn out half bad for my first go at it. We all tasted each others creations and determined that best in show for trial #1 was Clive's "Dark as the Night" blend, a 50% Malbec, 20% Merlot, 20% Cabernet and 10% Cab Franc combination. We set off on trial #2 (my second run was not so wonderful), and determined once again that Clive's "Dark as the Night 2.0" was indeed the best our table had created. We mixed up the big version to submit for judging, did a little field blending at the last minute (seriously, the container was already on the front table and Sean ran up there to add more Malbec in at the last minute) and crossed our fingers. It turns out that we should probably keep our day jobs, as we weren't the best blenders in the room, coming in 3rd place of four groups. Whoops. The winning table's members each took home a bottle of Columbia's 2003 Peninsula blend, a 55% Cabernet Sauvignon, 23% Cabernet Franc, 15% Merlot, 6% Mablec, and 1% Petit Verdot. After hearing a lot of this wine and its recent accolades, I might have to venture out and find a bottle for myself! While we didn't come out on top, I had so much fun creating my own blends, and left the seminar inspired to go home and start ripping into my 100% varietals of each of the Bordeaux grapes to start my own home blending operation. In any event, I can't wait for next year's seminars! 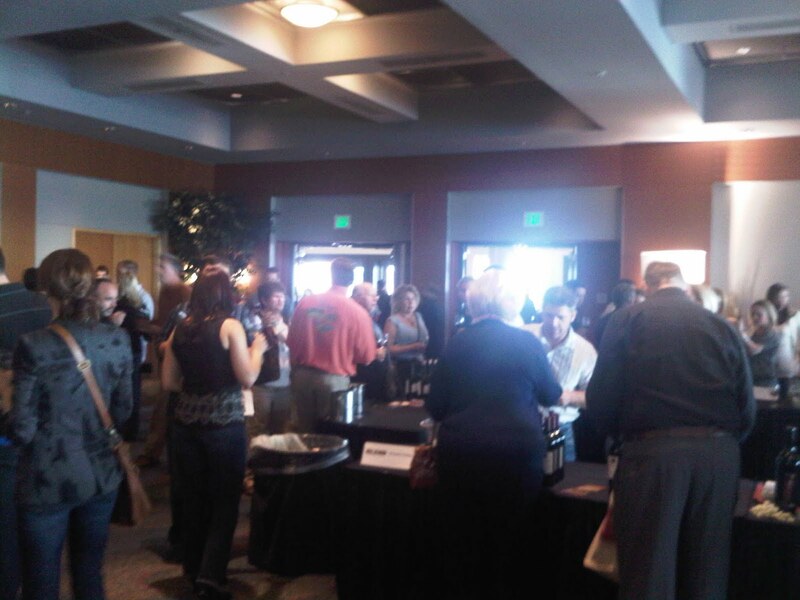 After the seminar was the general tasting event, which was spread throughout the convention center in separate rooms. I liked this spread out feel, as you were able to wander around the building, as well as take a break on the large patio extending off the side of the building. While there were way too many wines to recap here (this post would be a mile long), I took plenty of photos of the different wines I enjoyed at the event. Food was also incredible, with places offering up small bite size samples of everything from BBQ brisket sandwiches to granola crunch s'mores. There was a bite of something to please every taste. 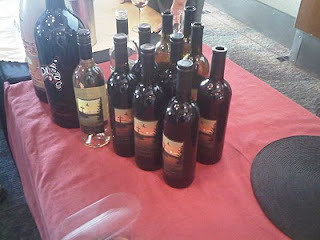 It was wonderful to chat with winemakers and friends and to try so many different blends of wine. Mike Sharadin of Northwest Totem Cellars (@NWTotemCellars) had his new 2007 Potlatch at the event, a Syrah, Tempranillo, and Grenache blend. 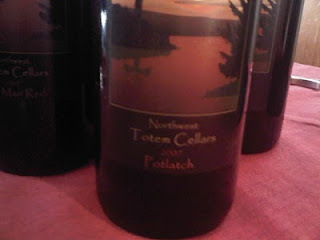 The 2006 Potlatch was a favorite of mine, so I was delighted to try the 2007 vintage. This bottle will open up even more in the future, very nice. 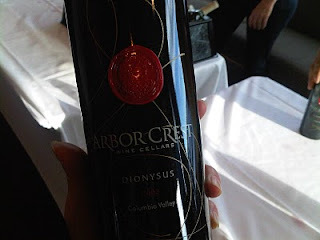 I always love trying new wineries and wines I have never had in the past, so I was excited to come across Arbor Crest Wine Cellars (@arborcrestwine), a winery based in Spokane, WA. 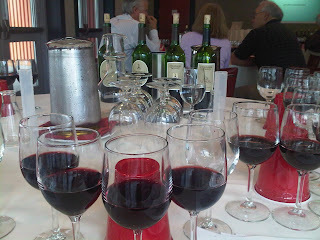 They were pouring their 2003 Dionysus, a 60% Cabernet Sauvignon, 20% Merlot, 15% Cabernet Franc and 5% Malbec blend. 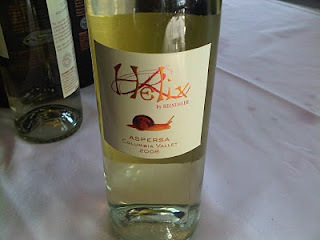 I really enjoyed this wine, which has won several awards and is a 90+ point rated wine in Wine Spectator & Wine Enthusiast. Another favorite was the 2008 Helix Aspersa, by Reininger Winery, based in Walla Walla, WA. 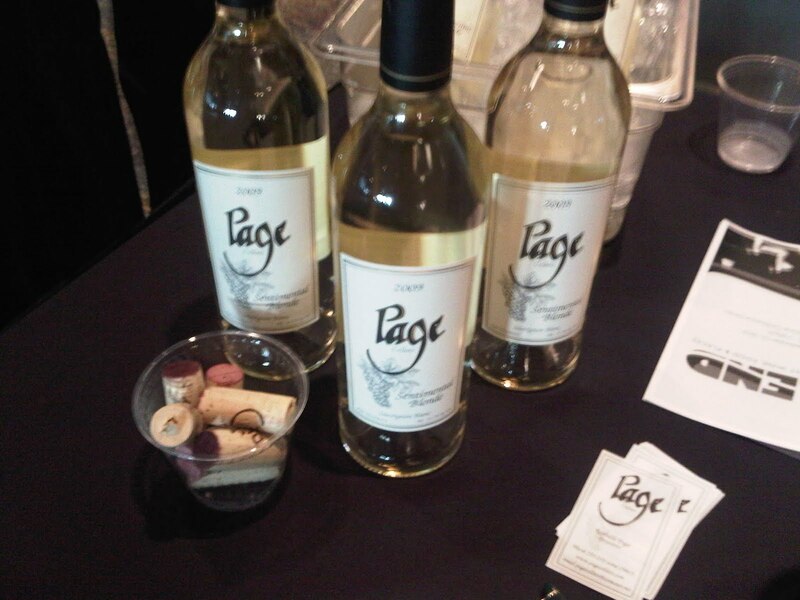 This 82% Chardonnay and 18% Viognier blend was a refreshing palate pleaser. I think my first quote after tasting this wine was "I want to be on a beach in a bikini with this wine", which got quite the laugh out of Mr. Sullivan. An additional white blend I enjoyed was the Page Cellars 2009 Sentimental Blonde, a Klipsun Vineyard 80% Sauvignon Blanc and 20% Semillon combination. Light and refreshing, this is another one of those "summer wines" that I love on a hot day (too bad we don't get any more of those days until next summer!). I'm so happy to have attended BLEND Seattle 2010. In addition to learning some great facts about Bordeaux blending and what types of wines come out of that French region, I was able to work my own magic to create my own Bordeaux blend! This is a must attend for any wine lover and I look forward to next year's event! Great props to Spokane. Sounds like a fun event...it was on my birthday too...wish I could have been there. Thanks Josh! We would loved to have had you there also. Would have been a great birthday event!